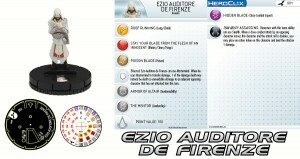 WizKids is beginning their new Assassin's Creed HeroClix set with Ezio Auditore de Firenze. Today we start of our previews of our 12-figure HeroClix: Assassin’s Creed micro-set. Based on the popular video game series this set will feature 12 all new sculpts in a Gravity Feed display, and we start our previews with one of the most prominent protagonists in the series, Ezio Auditore de Firenze!